FREESTANDING TRAGOPHYLLOCERAS - JURASSIC DORSET. Fine 3D Ammonite on free standing piece of matrix. Developed to the center on one side. Shows fine ribbing and sutures in parts. Nice little display piece. Jurassic, Lower Pliensbachian, Davoei Zone, Seatown Marl Member. Seatown, Lyme / Charmouth, Dorset. 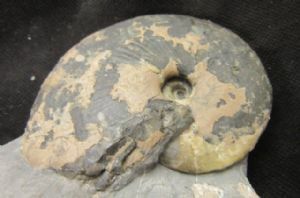 Ammonite : 7 cm. diam.